Here’s a number that might scare you: $14,132,959,955,340. That’s 14 trillion dollars, give or take a few hundred billion. That’s the current estimate of our national debt according to the OMB (Office of Management and Budget). 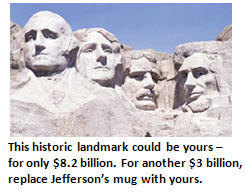 Here’s a slightly smaller but equally frightening number: $1 million. That’s the amount our nation’s debt is expanding – per minute. The clock is ticking. Depressed? Don’t be. Because I have a brilliant solution to the nation’s debt crisis. And it doesn’t involve painful tax hikes, closing down your favorite park or eliminating daily delivery of your mail. As many of you know, I (often imagine that I) am a highly sought-after, award-winning, Harvard-educated economist. I won’t drone on about my many notable achievements in the fields of econometrics or applied macro-economic asset price modeling theory (because there aren’t any). Suffice to say, I took both Econ-201 and Econ-202 in my second year of college. I have successfully balanced my family’s checkbook 9 of the past 12 months. And I have completely paid off our family’s credit card debt on all but 5 of our 17 credit cards. I saved $4,000 by the time I was 18 years old by doing summer jobs, and I didn’t blow it all until late spring of my freshman year of college (hey, I needed a new stereo system). So when I say I have a solution for the nation’s debt crisis, I think my credentials speak for themselves. Congress and the President can talk about cutting the deficit and reducing our debt. But it’s all lip service. Nobody is really going to cut defense spending by 25% or raise the retirement age for Social Security to age 70, let alone even hint that perhaps we need to raise taxes dramatically. No, none of our elected representatives has the political backbone and courage to do what’s needed. And thanks to my idea, they don’t have to! Question: What would you do if your family faced overwhelming debts you could not pay off? In my case, I’d probably just sell off my wife’s jewelry (but not her engagement ring because she might notice as I attempted to pry it off her finger). If need be, I might even part with my rare, priceless Mercury Dime collection. (Face value of my dime collection: $17.00; Current estimated fair market value: $25.00). But I would never sell either of my kids into some illegal slave trade – unless I really ran out of options, they were misbehaving really badly, and the buyer offered me a smokin’ price I just could not refuse. My point is this: If your back is against the wall, what do you do? You sell off some of your assets. Families do this all the time. They call it a garage sale. Corporations do it too. They call it finding a sucker to purchase the Hummer Division from GM. It’s about time our federal government followed the lead of millions of families and companies and start selling off some of its less important assets. If my neighbor Ed Biggelman can get $32 for his 10-year old Nordic Track with a timer that no longer works, surely Uncle Sam can fetch a fair price for some of the lesser used items in his attic – say Montana, for example. Washington Monument: $13.2 billion or Best Offer. 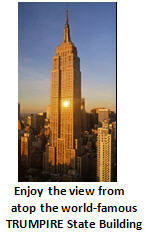 How would like you a high rise with a view to make your friends sick with envy? This is the place. Comes with a stunning view of our nation’s Capitol. Easy commute to the White House or Congress. Ideal for lobbyists, corrupt senators or people with no fear of heights. For just $420,000 more, we’ll even install an elevator. The US Coast Guard: $197 billion. Own your own branch of the U.S. Military. If you liked to play soldiers as a child, this is a must have. Comes with your own custom-tailored four-star admiral’s uniform and an assortment of medals to choose from. Trade medals with your friends or collect the whole set. Act now. Troop supplies are going fast. Comes with free quarterly pass to visit the White House Situation Room. State of Alaska: $780 billion. Call the Last Frontier your home with this incredible once-in-a-lifetime bargain. Be the first among your friends to own your own state. Comes with lots of room to spread out your stuff, not to mention access to our nation’s largest oil and natural gas pipeline. Stunning views of mountains, grizzly bears, bald eagles and hot ex-governors. Juneau what else? For just $20 billion more, we’ll even rename the state capitol after you. Flexible payment terms. Ask about our layaway plan. US Interstate 80: $87.6 billion. If you thought you could “get your kicks on Route 66”, you ain’t seen nothing yet. Own a part of the world’s greatest highway network. The nation’s second longest interstate, I-80, runs from scenic California through the Nevada Dessert (where you can do 130 mph and the state troopers won’t hassle you) through the golden corn fields of Nebraska, before your journey ends at glamorous New York City. 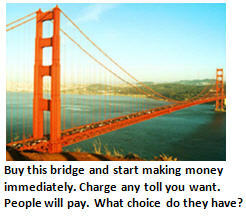 You want to institute tolls on your interstate? Go right ahead. Name your fare. 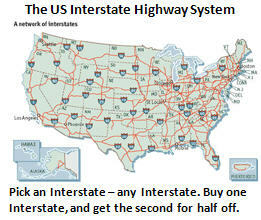 If you can’t afford the entire route, eliminate the stretch from Utah through Wyoming and save 15%. Nobody uses that portion anyway. Amtrak: $5,000 or best offer. We’ve all seen those guys in their 70’s still playing with their model trains. Some boys never grow up. And now you don’t have to either. Own your very own life-size train set and you can play with passenger trains from Portland, Maine to Portland, Oregon. Comes with your own conductor’s uniform and whistle. Can you say “Alllllllll aboard?” Batteries and federal government subsidies to ensure Amtrak’s continued survival, not included. According to my math, if the federal government sells the above items it will have paid off $1.1 trillion dollars – $5,000 more if you include Amtrak. Think of how much more the government could pay down its debt if it just got a little creative. How much do you think a certain someone might be willing to pay to sponsor the world-famous New York City landmark, the TRUMPIRE State Building? If you ask me, the two were made for each other. Hey, want to take the kids on a fantastic vacation this summer? Why not take them to the popular Denny’s Grand Slam Grand Canyon? Kids eat for half price at the Denny’s South Rim Grand Canyon Diner. 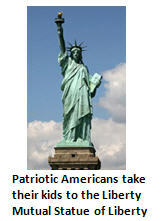 Or how about a visit to the historic Liberty Mutual Statue of Liberty? No one says God Bless America better than Liberty Mutual Insurance, America’s most patriotic insurance provider. Just imagine how much Uncle Sam could net for the naming rights to a few prestigious federal buildings, like the Capitol or the White House. You could even pay for sponsoring rights to the U.S. Senator of your choice. No wait, that idea’s already been done. Never mind. I’m sure that as a nation, if we all put our collective heads together, we can come up with many more creative ways to pay off our nation’s staggering debt in no time. Sorry, but I have to go. 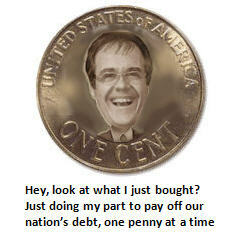 I just saw on eBay where they are offering the rights to put your face on the penny in place of Lincoln. And they’re only asking $6.2 billion. What a steal. I’ve got to get in on the bidding before I’m too late. Do you think they might accept the Discover card? Hope so. If you subscribe to THIS blog, please subscribe to Tim’s weekly posts as well at the link above. You will appreciate his sense of humor.